Diamonds symbolize perfection as they are indestructible. They are the strongest precious stone in existence. A diamond is also a symbol of purity and innocence, of love and fidelity (crystalvaults.com), and thus the jewel of choice to celebrate engagements, to honour marriages, and to signify eternity. A pink diamond is a result of a combination of intense pressure and heat while buried deep within the earth. The pressure and heat cause distortions in the crystal lattice that absorb green light, which reflects a pink hue. Red, blue, and pink diamonds are among the rarest diamonds in the world (naturallycoloured.com). Natural pink diamonds hold incredible value to investors and collectors. The online article ‘Pink Legacy diamond breaks world record for per-carat price’ states that “The largest fancy vivid pink diamond Christie’s has ever offered at auction has now broken a global record. 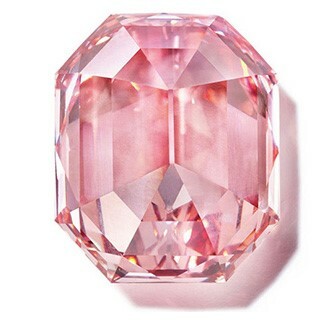 The 18.96-carat ‘Winston Pink Legacy’ sold to Harry Winston for US$50.3 million at the Magnificent Jewels sale in Geneva [November 13], setting a world auction record price per carat for a pink diamond” (jewellerybusiness.com). “The Winston Pink Legacy sold after five minutes of bidding. Its price per carat is calculated to be US$2.6 million”(jewellerybusiness.com). Buried deep within the earth was a gem of beauty, rarity, and great wealth; a real treasure.